Designed to act as a resource-rich and time-saving tool for busy construction professionals, the new Eurocell website has a wealth of features to make specifying windows, doors and roofline quicker and easier. Building on research findings that manufacturers need to make more information readily available to specifiers*, the new site includes windows BIM models, an interactive CPD video and template specifications to download, to name but a few features. Eurocell has created a dedicated ‘resources hub’ within the Specifier section of the site, so all materials are easily accessible from one place. Also included in the hub are range CAD drawings, product data sheets, copies of BBA Certificates, Building Regulations summaries and example case studies. The user can drill down into each section to get all the information required for any project. The resources hub offers downloadable PDFs that provide all the technical information required in a series of sample specifications designed to cover most typical applications. Architects and specifiers can also use the site for their Continuing Professional Development (CPD) courtesy of an interactive video that introduces Modus – the company’s innovative integrated window and door system. It explains the post-consumer recycled material process and technology used in the profiles; and how to achieve lower U-values at lower cost than is currently the case. Upon successfully answering the questions posed throughout the video, participants are emailed a certificate by return to validate their CPD points. And to aid specification even further, the site hosts commonly-specified Modus BIM models. Each Revit Family BIM model includes the three sash style options available with Modus, from the traditional fully-flush sash increasingly specified in conservation areas to the contemporary slim rebate, often chosen for mixed-use developments. To futureproof the models, the chosen window styles all achieve a 1.2 U-value, exceeding current Building Regulations performance standards. The advanced technical design of Modus means this is accomplished cost-effectively and can enable off-setting elsewhere in the building envelope, potentially improving overall performance whilst reducing costs. All the models are available in 900mm and 1200mm high options, sizes commonly specified for new build housing developments. A separate, comprehensive sustainability section provides accurate, up to date information about the credentials of PVC-U versus other materials. The introduction of post-consumer recycling has transformed the capabilities of PVC-U in recent years, but perceptions still lag behind reality. The Sustainability section makes the information available for specifiers to make their own, informed decisions objectively. There are also no fewer than 24 information and installation videos, which include step-by-step guides to installing Skypod skylights and Equinox, the fully insulated tiled roof system that converts a conservatory into a room. Naturally, the site is optimised to deliver the same usability to mobile devices such as smartphones, phablets and tablets as it would to a laptop or desktop computer. 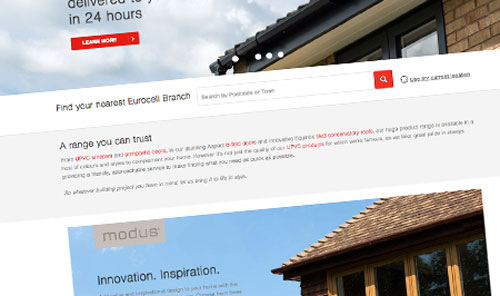 As a fully-fledged tool for e-commerce, the new Eurocell website enables consumers to purchase roofline products and trade customers to select any Eurocell product through a ‘Click & Collect’ service from any of the company’s 130-plus branches. And best-in-class security is guaranteed because the site meets the Payment Card Industry Data Security Standard (PCI DSS) Level 1, the highest proprietary information security standard for organisations that handle branded credit cards from the major card providers. *Source: Competitive Advantage: Eurocell New Product Concepts Research, 2014.